Tom's Tactical LLC is a family owned and operated business located in Texas. We aim to provide customers with the highest quality Made In America products at a low price along with free shipping. We offer our own line of lower parts kits, build kits, bolt carrier groups, upper receivers, and more. 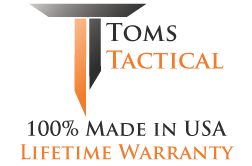 All Tom's Tactical brand parts are 100% made in USA using the highest level of manufacturing standards and include a lifetime warranty.